mip_fgshooter is a mental ray production shader that allows you to shoot final gather points from multiple cameras instead of just the render camera. These virtual FG cameras can greatly reduce flickering by providing stability to final gather points between frames. Increased stability reduces the need for overly aggressive final gather settings on difficult-to-light situations and can lead to faster render times as well as improved image quality. This offers similar advantages to baking FG points (see Flicker-free Final Gather in dynamic animations) but with a significantly simpler workflow. Also, I have put together a python script (complete with a user interface!) that will make using the fgshooter easy. Thanks to The Mill for letting me post this script. Generally, flicker is a result of changing indirect lighting contribution computations between frames. This indirect contribution computation is based off of the perceived indirect lighting at each of the FG points. Because the location/number of FG points is camera/geometry dependent, and cameras/geometry move between frames in animation, subtle differences in the locations of the FG points causes flicker. For instance, if part of the scene geometry is visible to the camera in one frame and not visible in another frame, you might get flickering if the indirect contribution around this geometry is important. Additional FG cameras that either do not move or can view geometry that might not be visible to the render camera for every frame, enable you to stabilize the indirect lighting contribution computations. For the HTC advertisement above, the green laser lights that write on the buildings were causing FG flicker because their intensity was so great. When the camera moved slightly, additional FG points inside the buildings would significantly change the indirect lighting contribution computations. Even brute force indirect lighting flickered because of the addition/loss of a few primary/eye rays changed the QMC determinism so much! We used stationary FG shooter cameras to anchor the FG points geometrically and kill the flicker at minimal cost to render time (much faster actually if you consider the original unnecessarily high FG settings). Because focal distance and aspect ratio information is passed via the scale attributes of the camera transform matrix to the mip_fgshooter shader, it can be somewhat difficult to use inside of Maya. You can create a virtual camera at the same location as the render camera (Include Render Camera). You can create virtual cameras that are fixed at a certain frame along the path of the render camera (Stationary Cameras). You can create virtual cameras that are offset in time by a few frames from the render camera (Offset Cameras). 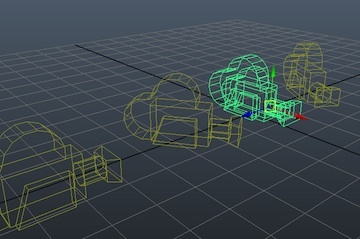 The defaults settings will create 4 virtual FG cameras: 1 at the position of the render camera and 3 stationary cameras at frames 0.0, 12.0, and 24.0. Specific settings will vary heavily scene to scene. If you wish to change from this default virtual camera setup, raise or lower the number of stationary or offset cameras and then click “Update”. The UI will now display the corresponding number of slots for each of the types of virtual cameras. 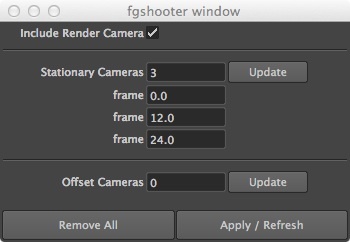 When you are ready to create the actual virtual cameras and mip_fgshooter node network, click “Apply / Refresh”. Since this script is not cumulative, the entire fgshooter setup will change every time you click this button. This way your scene won’t accumulate virtual final gather cameras. You may also remove all virtual cameras/mip_fgshooter/node networks by clicking “Remove All”. Note: This script will only create cameras for a non-default camera set as the render camera under render settings. In general, the more stable the final gather points, the more stable the final gather, so it is best to use the stationary cameras in combination with the render camera. This will be particularly useful for pans where flicker is being caused by small changes in the render camera’s position and orientation. For fly-throughs where the render camera’s position changes greatly, offset cameras may be more useful than stationary cameras. These offset cameras will help smooth out flicker by providing information from a few frames ahead and a few frames behind the render camera. You should always include the render camera. Animation below rendered with no lights, FG only with an animated camera and 3 fgshooter cameras (4 total) The image was tuned to the desired quality and then sent to render. No tuning for flickering was performed.